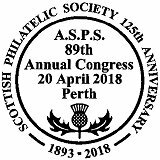 The 89th Congress of the Association of Scottish Philatelic Societies was held on Friday 20th and Saturday 21st of April, at its usual location, the Dewars Centre, in Perth, north of Edinburgh. This annual event includes a national exhibition, a display presented by the organizing association and a philatelic fair. 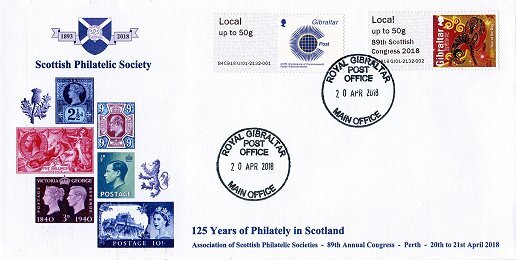 2018 marks the 125th anniversary of the founding of the Scottish Philatelic Society, the oldest society in Scotland, so the theme chosen for the 89th congress was '125 Years of Philately in Scotland'. (See articles dedicated to the congresses of 2012 -VARIABLE 27-, 2013 -VARIABLE 29-, 2014 -VARIABLE 33-, 2015 -VARIABLE 37-, 2016 -VARIABLE 41- & 2017 -VARIABLE 45-). 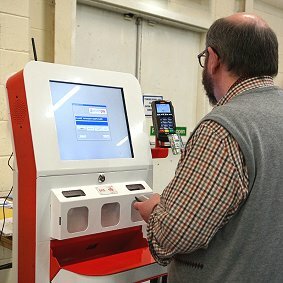 Since 2012, Royal Mail has had a presence at Perth which has included the installation of its 'Post & Go' kiosks. Hytech machines were installed during the first 2 years, with the new Intelligent AR kiosks from 2014 onwards. 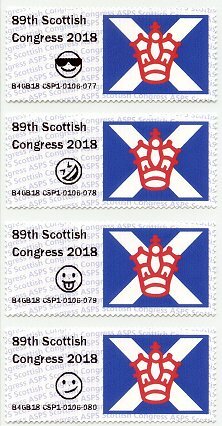 This year 2018, after some 6 years, Royal Mail decided it would no longer continue installing 'Post & Go' equipments at philatelic events and so there were none either at Spring Stampex 2018 (see article, also published in VARIABLE 48), or at the Perth congress. 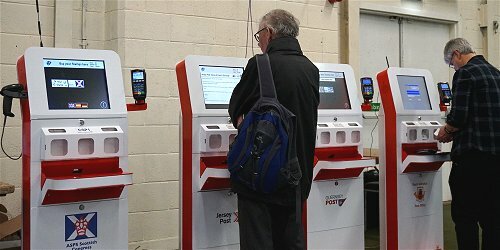 However, even without Royal Mail, the 2018 congress had more installed kiosks than ever before, with machines from three postal administrations, Gibraltar, Guernsey and Jersey, and a fourth kiosk exclusively for the printing of commemorative labels or cinderellas. 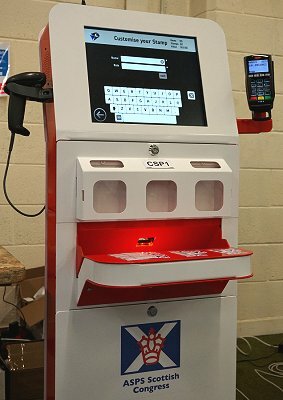 In 2018 for the first time, RGPO installed its GI01 philatelic kiosk at the Perth congress. 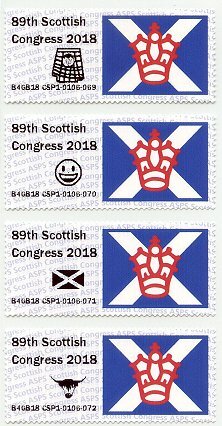 During the two days, the machine issued stamps with the 'Year of the Dog' design carrying the '89th Scottish Congress 2018' special imprint from one of the printers, and the new CCPA design, with no special imprint, from the other. 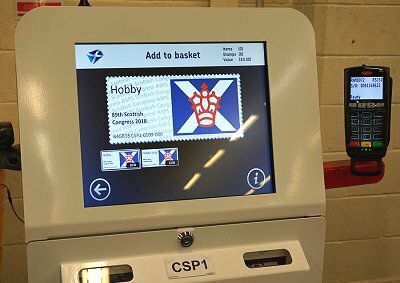 Indeed, the Gibraltar postal administration took advantage of its visit to Scotland to launch a new label design for its postal kiosks, dedicated to the CCPA (Conference of Commonwealth Postal Administrations). The CCPA is an association that brings together the postal administrations of countries belonging to the Commonwealth and whose main objective is to establish relations between its members to improve the quality and accessibility of its postal services. This new issue of the Royal Gibraltar Post Office marks the election of Gibraltar as Chair of the Conference of Commonwealth Postal Administrations. The launch of this issue in Perth, on April 20th, coincided with the last day of the 2018 Commonwealth Heads of Government Meeting, held in London. 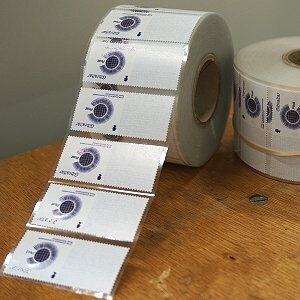 Like other designs issued from the Intelligent AR kiosks, the rolls of thermal labels were manufactured by Cartor /Walsall Security Printing, with digital printing. However, on this occasion, the company produced rolls of labels attached to the usual yellow silicone coated backing paper, and in addition two rolls of labels on a transparent release liner (film). 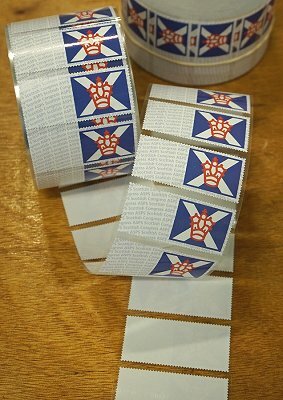 Although this type of roll had already been manufactured for the issue of sample labels or cinderellas, it is the first time these have been used for the printing of stamps. The design of labels on both types of rolls is the same, although the finish of the printing of the pictorial area is brighter in those on the transparent release liner. 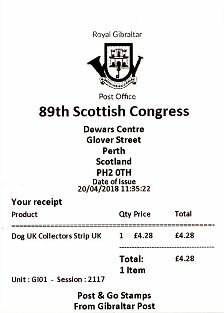 GI01 kiosk was programmed with six postal rates, which make up the UK set or the 'Collectors Strip UK' (see receipts below). It includes the five basic postal rates, within the first weight step, for the five postal zones established in Gibraltar (local mail, Spain, United Kingdom, European countries and the Rest of the World), plus the tariff to the Rest of the World for shipments up to 40 g.
The bottom code of all stamps issued by the GI01 machine in Perth starts with B4GB18. When the first roll of labels with the CCPA design was used up (central column), on the afternoon of the first day of issue, it was replaced by a roll of labels with the transparent liner (right column). After Perth, the CCPA design was also available, from April 23rd, from the two postal kiosks installed in Gibraltar's post offices (see article, also published in VARIABLE 49). 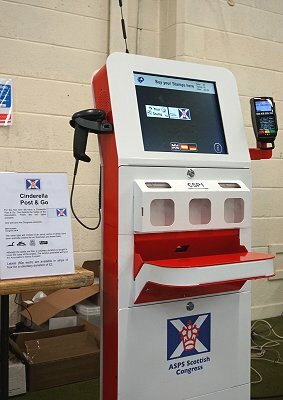 Guernsey Post's GG01 kiosk also attended the Perth congress in 2018 for the first time. 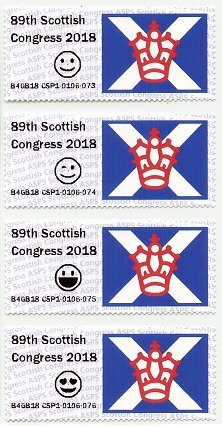 During the two days, the machine issued stamps with the 'Guernsey flag' definitive design and the '89th Scottish Congress 2018' special imprint from one of the printers, and the 'Guernsey Bailiwick Flowers' thematic series launched at Spring Stampex 2018, with no special imprint, on the other. 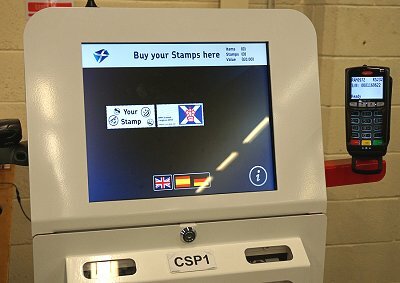 The six values programmed in the GG01 kiosk correspond to the first two postage rates for local and United Kingdom mail, for normal size and 'Large' letters, plus the two tariffs in the first weight step up to 20g to Europe and rest of the world. The first block of the code at the bottom of all the stamps issued by the kiosk at this philatelic event is B4GB18 GG01, followed by the session and stamp number. 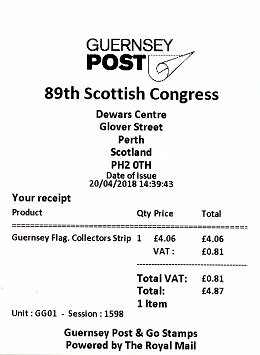 The Philatelic Bureau also sells six-value sets or 'Collectors strips' with the 'Guernsey flag' design and the same commemorative imprint, but with code B4GG18 B002, produced on the back office printer. 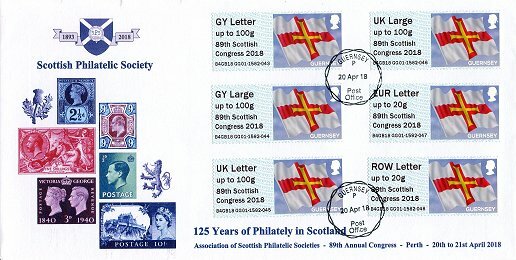 The JE01 Jersey Post's kiosk attended the Perth congresses of the Association of Scottish philatelic societies in 2014, 2015 and 2016, and returned for the fourth time in 2018. During the two days, the machine issued stamps with the 'Jersey flag' definitive design with the special imprint, common to the other two philatelic kiosks i.e. 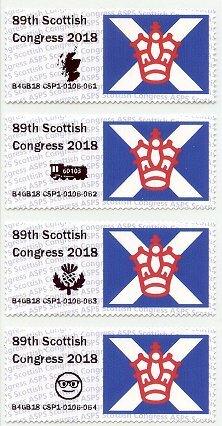 '89th Scottish Congress 2018', from one of the printers, and the 'Visiting Naval Vessels' thematic series presented at Spring Stampex 2018, with no special imprint, on the other. The six values programmed in the JE01 kiosk correspond to the first two postal rates for local and United Kingdom mail, for normal size and 'Large' letters, plus the two tariffs, in the first weight step up to 100g, to Europe and rest of the world. 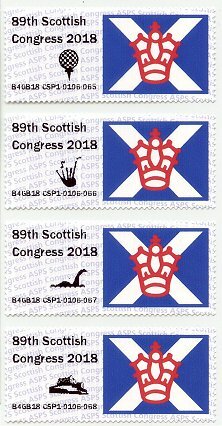 The first block of the code at the bottom of all the stamps issued by the kiosk at the Perth congress is B4GB18 JE01, followed by the session and stamp number. 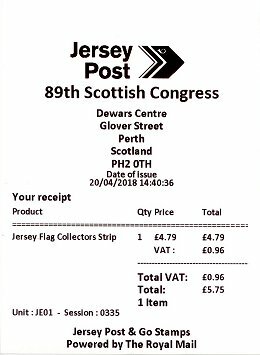 Jersey Philatelic Bureau also sells 'Collectors strips' with the 'Jersey flag' design and the same commemorative imprint, but with code B4JE18 B002, produced by the back office printer. 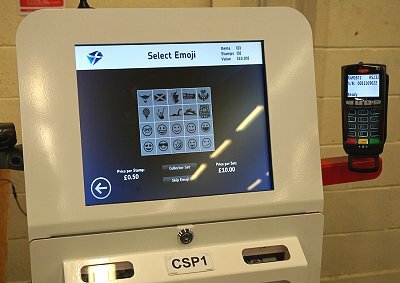 New for Perth 2018 and as with Spring Stampex 2018 (see article, also published in VARIABLE 48), Cartor Security Printing and Intelligent AR collaborated with the congress organization by installing its CSP1 test kiosk. During the two days, the machine issued commemorative self-adhesive labels, (cinderellas with no postal value), illustrated with the badge of the association and a variety of imprints. Cartor manufactured the rolls of labels again using a transparent film release liner. 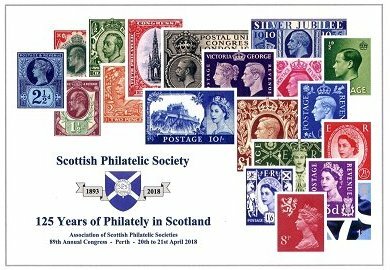 The profits obtained from the sale of the cinderellas were used to fund Stamp It, an Association of Scottish Philatelic Societies project designed to promote philately among children. or the user could customize the text printed on the labels and add an image. The menu showed 20 different clip art images to choose from; 10 specially created by the organization, with motifs related to Scotland, and 10 face emojis.